Shopping for Alien / Aliens Statues? Watch out! The Xenomorph is ready to attack! The Aliens Warrior Drone ArtFX+ Statue measures 6-inches tall. The base mirrors the flooring of the spaceship Sulaco! Measuring just under 6-inches tall in 1:10 scale, this excellently detailed Alien creeps forward and crouches on a base mirroring the flooring of the spaceship Sulaco. Watch out! The drone is ready to attack! 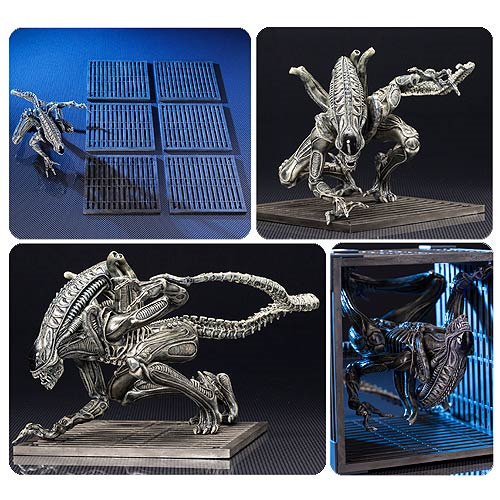 The Aliens Warrior Drone ArtFX+ Statue comes in window-box packaging. Ages 14 and up. The drone is an adult form of the species Xenomorph XX121, often said to be the most basic adult caste. It's a loyal servant for the queen, but essentially represents the lowliest class of Xenomorph, comparable to a worker ant. Drones construct Xenomorph hives, using a resin-like secretion that they produce, and collect hosts for impregnation. Drones are easily identified by their smooth head carapaces, among the smoothest of all Xenomorphs, and they are capable of spitting cysts of acidic blood at their enemies. They average around 7 to 8-feet tall when standing on hind legs, and about 14 to15-feet long, tail included.